Experience one of the world's greatest train journeys aboard The Legendary Ghan. The legend has soared to new heights with the extension of The Ghan journey to Darwin. When The Ghan first departed Adelaide for Alice Springs, it was always intended that it would one day travel through to Darwin. More than 70 years later, that dream has become reality. The Ghan now travels 2,979 kilometers from Adelaide to Darwin on this transcontinental journey through the Red Centre of Australia. 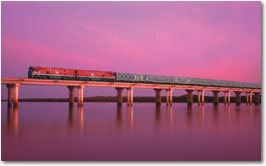 The Ghan offers a weekly return journey between Adelaide and Darwin, and in either direction provides two nights aboard this legendary train. Marvel at the spectacular Australian landscapes; from the rusty reds of the MacDonnell Ranges surrounding Alice Springs, gateway to Ayers Rock and the Red Centre, then north to Tennant Creek, Katherine and the tropical splendor of Darwin. Off-train touring is a feature of the new journey, providing the chance to learn more about the unique desert flora and fauna. The Darwin Train Station is situated approximately 20 minutes south of the city centre. Complimentary coach transfers are provided for Gold guests to/from the following hotels: Crowne Plaza Hotel, Darwin Central, Holiday Inn, Holiday Inn Esplanade, Mirambeena Resort, SKYCITY Darwin Hotel and Novotel Atrium. 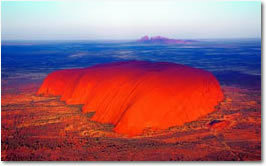 Prices are per person in Australian dollar and do not include taxes and fees. Prices are subject to change without notice. Gold and Platinum fares include all meals and private compartments. (*) Indicates a non-refundable or changeable fare. To step aboard The Australian rail system is to step into a different world, a world “down under,” as it is fondly described. Ride on rails that will bring you a journey filled with rugged terrain, luxury, and overall warmth that can be found nowhere else on the planet.